← INCREDIBLE! 500,000 PERUVIANS MARCH FOR LIFE! IT GIVES US HOPE IN THE WORLDWIDE FIGHT AGAINST THE CULTURE OF DEATH! SPRINGTIME IN PARIS!!! OH, HOW WONDERFUL IT WOULD BE TO BE THERE!!! Springtime in Parish, oh how wonderful that would be! Just thinking about it brings back so many wonderful memories of Paris. I think of Gene Kelley dancing in the rain and Audrey Hepburn radiating her lovely presence in the midst of that glorious city. I remember celebrating Mass at the high altar of Notre Dame Cathedral at the invitation of the Rector of the Cathedral when he learned that I was leading a group of 40 knights and ladies of the Equestrian Order of the Holy Sepulchre of Jerusalem on a pilgrimage to the Shrine of Saint Therese in Normandy and then on to Rome. The Catholic character of France is to be seen in its Architecture and in the memory of the great saints that France gave birth to. France Pagan. Frank Sheed taught me apologetics at the University of Fribourg in 1950. Things changed radically in France following the Age of Enlightenment and the French Revolution. 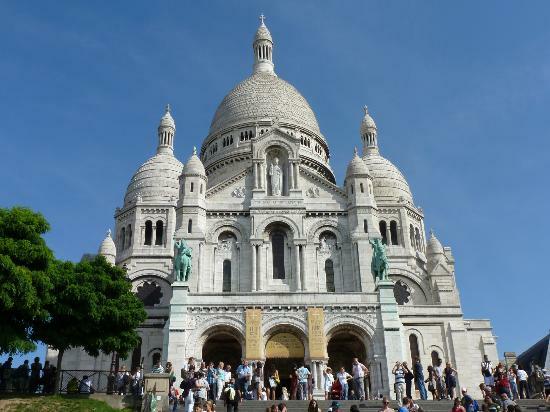 This entry was posted in Uncategorized and tagged Audrey Hepburn, Basilica of Sacre Coeur du Montmarte, FRANK SHEED, Maisie Ward, memories of Paris, Notre Dame Cathedral. Bookmark the permalink. 2 Responses to SPRINGTIME IN PARIS!!! OH, HOW WONDERFUL IT WOULD BE TO BE THERE!!! Confidencialidad Este correo electrónico y, en su caso, cualquier anexo al mismo, contiene información de carácter confidencial exclusivamente dirigida a su destinatario o destinatarios y propiedad de Carlos Manuel Gracida Maldonado. Queda prohibido su divulgación, copia o distribución a terceros sin la previa autorización escrita de Carlos Manuel Gracida Maldonado, en virtud de la legislación vigente. En el caso de haber recibido este correo electrónico por error, se ruega notificar inmediatamente esta circunstancia mediante reenvío a la dirección electrónica del remitente y la destrucción del mismo. Confidentiality The information in this e-mail and in any attachments is classified as Carlos Manuel Gracida Maldonado Confidential and Propietary Information and solely for the attention and use of the named addressee(s). You are hereby notified that any dissemination, distribution or copy of this communication is prohibited by law. If you have received this communication in error, please, notify the sender by reply e-mail.